Celebrity hairstyles – fun to look at, fun to pin and fun to ask your stylist for. I did some searching to find a few of the most popular and most requested (when heading to the salon) celebrity hairstyles. If you’re in a serious hair rut and could use some inspiration, I hope these help! Alexa Chung went with a short up-do, with bangs and wispy sections peeking out from the sides and back. If you have short hair, this is your perfect solution to an up-do. To get this look, just pull hair back low on the neck and wrap with an elastic band. Pull a few small sections of hair out to frame your face. Here’s a great tutorial on getting the low, messy red carpet bun look. Michelle Williams signature pixie cut has become quite popular at salons. She makes this style look effortless and shows us there is nothing boring about styling a pixie. Here, she’s teased it at the crown to give it some volume. How to style a pixie cut with long bangs tutorial. January Jones sure knows how to rock the bob from the 1960s. For this style, she has full side swept bangs, with some height at the crown. Julianne Hough’s blond tousled waves have become quite popular over the years. Whether she’s sporting long locks or her current short, her hair styles are wanted and copied over and over again. Here’s another fabulous low up-do starring Julia Roberts. This look is great for summer when you want your hair pulled back. Have second day hair? Pull it back like this and you’re good to go! Jennifer Lawrence’s shaggy pixie cut came on the scene and fans went nuts. I’m fairly certain J-Law can rock any cut, but this one suits her well. How to style the Jennifer Lawrence pixie cut. Elizabeth Olsen’s medium length blond cut is beautiful and the perfect cut and color for summer. Have you ever faked shorter hair? Or maybe you’re thinking about going shorter but you’re just not sure. 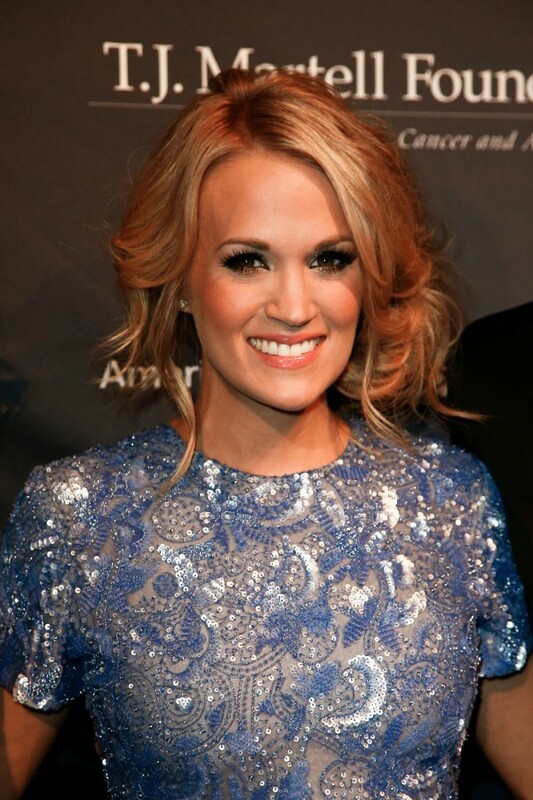 Fake it like Carrie Underwood did with this faux bob. All it takes is some bobby pins and a little patience. Just curl your hair and pin the longer sections up. Claire Daines long blond layers are stunning on her. It’s simple with a deep side part and the ends curled just slightly. 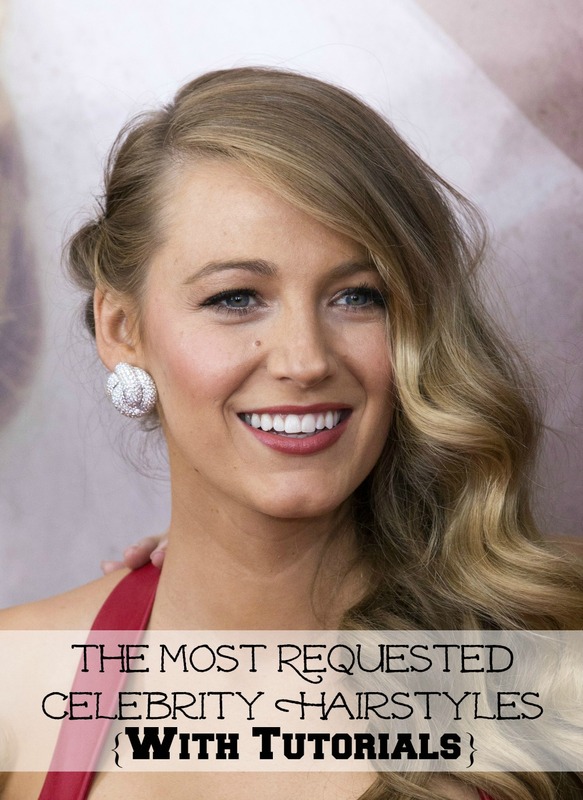 Whether it’s her color, cut or style – Blake Lively’s hair is always spot on. This look is perfect for a dressier occasion. Curl your hair to create soft ways and pin in off the side where it lays over one shoulder. Just beautiful! Halle Berry knows how to make bangs look good doesn’t she? I love this longer look on her featuring bangs and a subtle ombre color. Drew Barrymore kills it when it comes to the middle part. This deep color and those curls look stunning on her. Get some Drew Barrymore hair secrets in the clip below. Zooey Deschanel and bangs go hand in hand. She was sporting bangs (and doing it well) before they became so popular. Jennifer Aniston, the hair envy of every woman in America. Am I right? Jennifer Lopez’s ombre blond hair is so pretty with her skin tone. This blond bob is so cute on Brooklyn Decker. This has been a highly sought after style, especially during the summer. Are there any particular celebrity hairstyles you’re wanting to try?